I have skipped a few weekly recaps lately, and I want to be sure I start up again as we get into CIM training. I enjoy being able to look back on my workouts and thoughts I had during the week, especially the ones during Seattle RnR marathon training. It's good to remember that I have felt discouraged before and to see how I powered through those thoughts. It's also nice to read thoughts about my great days and to know they exist too. This past Saturday was the first long run of California International Marathon training, so I'm officially into my next training schedule. I'm feeling good about the idea and love that so many people I know are running CIM. It should be a fun event, and it's an easy drive from San Jose too. I love easy logistics and low stress races. I outline my planned workout against my actual workout to keep track of changes in my training plan. It's not unusual for me to move things around, and I'm also contemplating adding mileage to the standard Hal Higdon plan I have set up to become a higher weekly mileage runner. We'll see how it all goes. Now, on to the weekly recap. Felt a little sluggish during this run, but overall it was ok. Nothing special. Today was our 8 year wedding anniversary! I had a sand volleyball game, which we unfortunately lost. I squeezed in a short run to try out my new Brooks Adrenaline 12s and then headed off to a fancy celebration dinner at Morton's. Yum! 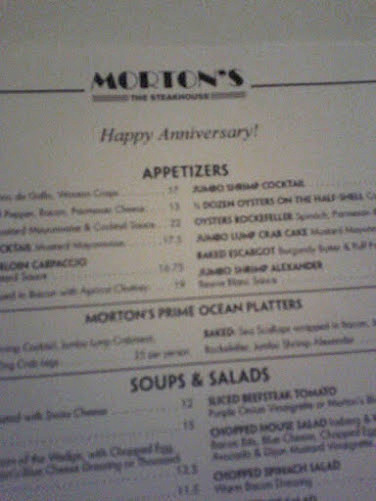 Even our menu said 'Happy Anniversary' at the top! Alisyn invited me to a morning trail run in Los Gatos, which worked out great after I skipped my Tuesday run for the dinner. We ran the St. Joseph trail from downtown Los Gatos, a very hilly run with gorgeous scenery. I need to do this more often! The uphill sections were slow with some walking, but the last couple of miles on the flat part of Los Gatos Creek Trail were at a 9 minute pace. I felt great in the early morning cool weather and loved following it with coffee from Los Gatos Roasting Company. I went to my core class after work too, and I was pretty tired from getting up at 5:30 am. Still glad I did. 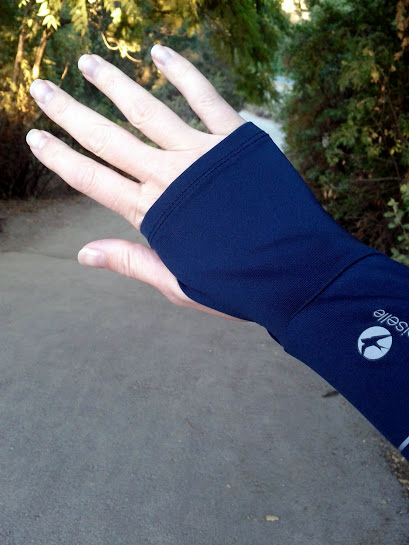 Chilly enough to break out the arm warmers, love. Moved rest days around because runs moved. I did Thursday's planned run on Friday to give myself a rest day post-trail run and core class. Easy run in Mountain View on the Bay Trail. I wanted to do 8 or 9 this weekend as the first long run for the CIM cycle, but by the time we got out the door it was 90 degrees and felt so hot. I settled with the idea of 8, but cut even cut that a little short because it was brutal in the sun. Don't worry, I feel like I worked plenty hard enough on this one in the heat! This run was followed by a refreshing dip in the condo pool, aaahhh. Have a good week all, and just keep running! Isn't it great to have a record of workout highs and lows?! Sand volleyball sounds like a most excellent idea for cross training. And the sun has been so brutal lately. And just curious, with your Oiselle tanks, did you purchase the same size that your team tank came in? My team tanks seems a little big, so I was wondering if I should go down a size for ordering other tanks. About to put in a ginormous order. My race singlet is a little big, but it's the same size I always order. That said, I've been thinking about seeing if I can swap it for a smaller size. I wouldn't go down in normal tanks based on the singlet. Sand volleyball is a great workout but so much fun! Hope you have a wonderful week. Sounds like you had a great training week! I used Hal Higdon for my first 1/2 marathon and I loved it. His plans are great and I've heard nothing but good reports from others.